AFTER PLAYING LESS than ten minutes in the Dallas Mavericks’ Game 2 loss to the Houston Rockets, the Mavericks announced Rajon Rondo is out indefinitely with a back injury. The Rondo trade turned into a disaster for the Mavs. He didn’t fit with the team’s fast-paced, spread offense and he didn’t jell with Carlisle, with the two fighting during and after a February game over play-calling duties. That Rondo couldn’t fit into one of the best offenses in the NBA; one that exemplifies much of what a modern NBA offense looks like; spells trouble for his future. As a free agent this summer, finding an ideal team fit for Rondo is difficult, simply because he plays differently than most successful point guards do in 2015. Seeing Rondo in a “pace-and-space” offensive system wasn’t encouraging for his future. What played out on the court with the Mavs is the same thing people worried about upon his arrival: Rondo needs to dominate the ball to run an offense, and when he doesn’t have the ball, defenses don’t respect him as a shooting threat. That year; that last year of the Garnett-Pierce-Allen era; the Celtics played at the 22nd slowest pace in the NBA, averaging 92.6 possessions per game. In 2014-15, that would be dead-last in the NBA. In 2011-12, 12 teams averaged over 20 three-pointers per game, with the Orlando Magic leading the league in attempts per game with 27. In 2014-15, 19 NBA teams took over 20 three-pointers per game, four of them averaging over 27 per game. In 2011-12, 22 teams averaged 24 or more shot attempts from midrange. 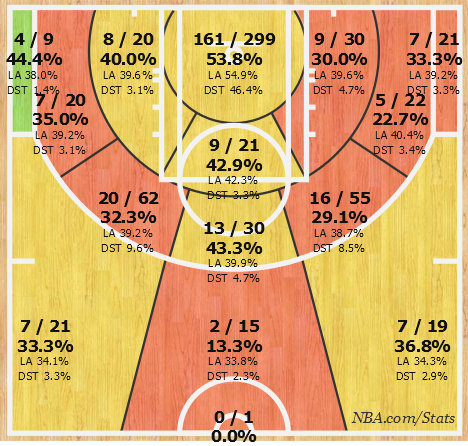 In 2014-15, nine teams averaged 24 or more shot attempts from midrange. In the span of three years, the NBA has realized that fast-paced offense with an abundance of three-pointers and shots at the rim is the most efficient way to score, while teams have begun to ignore less efficient midrange shots. Enter Rondo. In 2011-12 he was an All-Star, averaging 12 points on 45% shooting, 24% from three, and 5 rebounds and 12 assists per game. He thrived for a Celtics team that played at the 22nd slowest pace, were third in the NBA in midrange attempts per game, and 24th in three-point attempts per game. For a championship contender, they pushed hard against emerging norms in offense, perhaps because they were elite defensively. The Celtics also possessed three future Hall of Fame players in Pierce, Garnett, and Allen, all of whom were past their primes and willing to sacrifice on offense for the betterment of the team, thus handing Rondo the keys to the offense. And Rondo excelled, but it was in such a unique situation that it seems impossible to replicate in 2015. Finding the 2014-15 equivalent of the 2011-12 Celtics is tough to do. Team that rank in the bottom third of the league in pace, bottom third in three-pointers attempted, and top third in midrange jumpers attempted simply don’t have much success. Some teams that come close to those qualities: the Knicks, Lakers, Timberwolves, Bucks, Wizards, and Hornets, only one of whom finished above .500 this season. And none of them had three future Hall of Famers on their rosters. So where does Rondo, a free agent for the first time on July 1, fit in the NBA? Ball-dominant point guards aren’t uncommon in the NBA, but Rondo’s type of ball dominance just doesn’t seem to fit. Using the NBA’s player-tracking data, we can see how often players touch the ball. In 2014-15, Rondo ranked 15th in touches per game. Yet, among the 14 other players , Rondo was was lowest in points per touch, scoring only .08 points per touch. In comparison, the leader of that top 15 was Russell Westbrook with .309 points per touch â&#128;&#148; more than triple Rondo’s output. 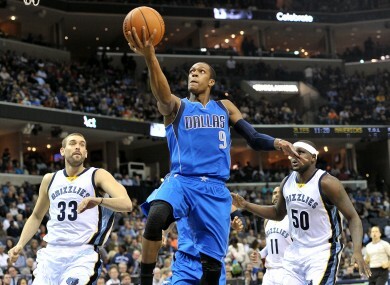 So what was Rondo doing with the ball? He didn’t average an exceptional number of drives per game; he was 28th in the NBA. He only averaged 3.2 points per game on drives. While he was first in the NBA in passes per game, he was eighth in the NBA in assists per game. Rondo was seventh in points created by assists with 18.7 points per game on the season, but this was also a function of him dominating the ball. Though he can set up good shots for teammates, he doesn’t necessarily promote good ball movement. The NBA tracks secondary assists; assists given to a teammate after they received a pass from a player; and Rondo was only 45th, meaning he didn’t set teammates up to make good passes. According to NBA.com/Stats, Rondo shot just 34.6% on catch-and-shoot opportunities, but he shot a respectable 35.9% on three-pointers. The problem is, Rondo prefers to dominate the ball, and he only averaged 1.5 catch-and-shoot opportunities per game and 0.8 catch-and-shoot three-pointers per game. Where there's the potential for Rondo to leverage a weakness into a skill, he hasn't adapted. So as Rondo enters a fairly strong free agent class, where does he fit? It's not a matter of if a team will sign him; somebody will; but it's who. What team can use a ball-dominant point guard who can't shoot? Theoretically, a team would need three very good shooters to surround Rondo to make up for his lack of spacing, but they'd also need players who don't dominate the ball, either. The Celtics provided this with Pierce, Allen, and Garnett, who were happy to catch and shoot, but again, that team didn't have a great offense; they had a great defense. The Mavericks provided the spacing around Rondo, but he and Monta Ellis, who also commands the ball, didn't fit well next to each other. Rondo is as unique a player as the NBA has ever seen, and he's undoubtedly gifted in several areas. Unfortunately, the times he's proven most successful with were in a system that is now outdated. A team will still take a chance on Rondo, but the days of thinking he's a max player are over. In another era, Rondo could skate by without being an elite shooter and dominate the ball while teammates waited patiently. But in an NBA where teams emphasize ball movement, three-pointers, and space, Rondo doesn't seem to fit. Unfortunately for Rondo, after the breakup of the Big Three Celtics, the NBA passed him by. Email “How Rajon Rondo, the NBA's unique star, is being left behind amid basketball's evolution ”. Feedback on “How Rajon Rondo, the NBA's unique star, is being left behind amid basketball's evolution ”.